Monetary Rates of any country always played a major role in their economy and financial market including stock market. Central bank of a country control the supply of liquidity in the market trough various type of monetary tools on time to time and control the economic's growth and it's fundamental. By using Cash Reserve Ratio (CRR), Repo Rate, Reverse Repo Rate, Statutory Liquidity Ratio (SLR), Bank Rate and Base Rate central bank control the monetary policy smoothly. Along with these tools monetary authority also control the economic fundamental with open market operation. By following charts you can see the key policy rates historical trend of change by Indian banking authority the Reserve Bank of India. 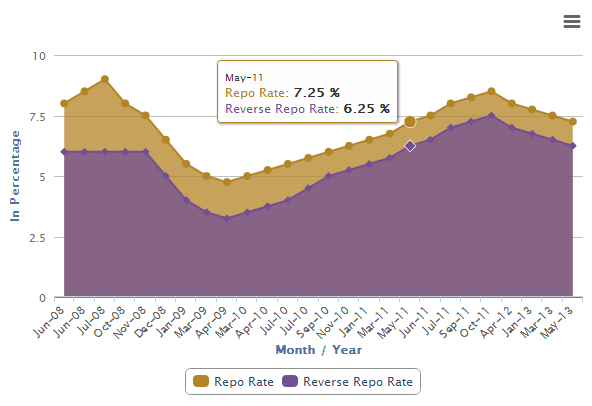 Repo Rate : Repo Rate is the rate at which RBI's associate bank borrow the fund from Reserve Bank of India. RBI provide cash liquidity to its associate banks at cheaper rate by reduction in repo rate. Increase in repo rate by RBI makes borrowing expensive for bakers and alongwith it's customers. Central bank control the whole banking system by increase or decrease in repo rate. Reverse Repo Rate : Reverse Repo Rate is contrary of Repo Rate. Rate at which RBI borrow the money from it's associate banks. There have get opportunity to earn higher interest with safe way by increase in reverse repo to commercial bank. Also RBI uses reverse repo rate to pull extra money of commercial banks and from the market. Cash Reserve Ratio (CRR) is a specified minimum fraction of the total deposits of customers, which Bankers in India are required to hold a certain proportion of their deposits as reserves, either in cash or as deposits with the RBI. In India Cash Reserve Ratio is set according to the guidelines of the Reserve Bank of India. Statutory Liquidity Ratio (SLR) : Every bank is required to maintain at the close of business every day, a minimum proportion of their Net Demand and Time Liabilities as liquid assets in the form of cash, gold and un-encumbered approved securities. The ratio of liquid assets to demand and time liabilities is known as Statutory Liquidity Ratio (SLR). Present SLR is 23%. (from earlier 24%) RBI is empowered to increase this ratio up to 40%. If SLR is increased, then banks have less money to lend as result they will charge more interest rates on loans to keep the profit margin same. An increase in SLR also restrict the bank’s leverage position to pump more money into the economy.